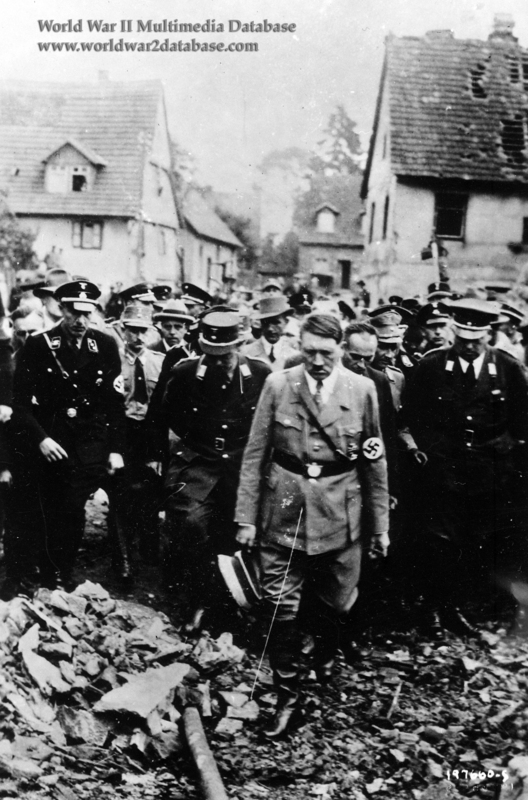 Still frame from film of Reichskanzler (Reichchancellor) Adolf Hitler grimly walking through damaged residential areas of Oeschelbronn after munitions plant explosion. On September 10, 1933, a disastrous explosion destroyed 203 homes; the cause has never been determined. After the explosion and subsequent public outpouring of support for the town of Neunkirchen, which suffered a gas explosion in an iron works on February 10, 1933, the Nazis decided to capitalize on the destruction of Ochselbrunn to enhance the Fuerher's public image. The film was used by Minister of Propaganda Joseph Goebbels to enhance Hitler's connection with the common German. Later, when Hitler couldn't bring himself to visit cities and towns that had been bombed, this same film was used instead. Hitler, furious about the bombings and their embarrassment to Germany, would order his limousine to go around bombed areas and avoided viewing the destruction. A captured copy was also used for propaganda purposes by the US Army Signal Corps.